12-06-2002 10:00 pm Paris - The remains of more than three million ships and their cargoes are thought to lie beneath the world's oceans. Historical monuments such as the lighthouse in Alexandria (Egypt) and whole towns such as Port Royal (Jamaica) also lie at the bottom ofthe oceans. These underwater treasures attract professional looters who use increasingly advanced technology to systematically pillage them. To preserve this underwater cultural heritage and to curb the looting of wrecks for commercial ends, UNESCO's Culture Sector and its Caribbean office are organizing a meeting in Kingston (Jamaica) from June 17 to 20, to urge states in the region to ratify the UNESCO Convention on the Protection of Underwater Cultural Heritage. The Convention, adopted on November 2 last year, aims to protect "all traces of human existence having a cultural, historical or archaeological character, which have been partially or totally under water, periodically or continuously, for at least 100 years." However, as UNESCO Assistant Director-General for Culture Mounir Bouchenaki points out, "the adoption of the Convention is not enough. We need 20 Member States to ratify it before it can come into force." The meeting in Kingston will bring together about 150 delegates and experts from some 50 countries, especially from Latin America and the Caribbean, regions whose history has left them with an exceptionally rich underwater heritage. The archaeological work done over ten years at the sunken Port Royal site, for example, has given scientistsa unique opportunity to study 17th century urban organization, architecture and the daily life that existed before an earthquake and tsunami destroyed the town in 1692. In Bermuda, whose underwater treasures have recently drawn not just archaeologistsbut professional salvage companies that recover treasure to sell, laws are being passed to put a stop to underwater looting. 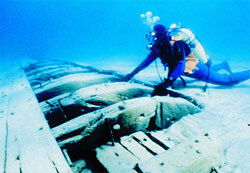 In the Bay of Montevideo (Uruguay) lie the wrecks of more than 200 large ships that went down between 1772 and 1930. They include frigates, brigs, corvettes, steamships and other vessels that plied the waters between the Rio de la Plata estuary and North America or carried passengers between Uruguay and Argentina. For all these reasons, says Bouchenaki, "I am positive that UNESCO Member States from this region will be some of the first (to ratify the Convention)." Although the new Convention emphasizes in situ preservation of all underwater heritage, and prefers careful exploration to raising items, it also deals with their protection if they are brought up. Signatory states promise to curb the activity of treasure-hunters and punish all infringements of the rules, and the Convention says they shall "take measures to prevent the entry into their territory, the dealing in, or the possession of underwater cultural heritage illicitly exported and/or recovered." Two other clauses of the Convention urge States parties to encourage "responsible non-intrusive access" by the public to sites that contain underwater heritage and mention the need to make people aware of its importance and significance. The Kingston meeting will discuss the possibilities of training experts in underwater excavation with the goal of establishing a pool of underwater archaeologists wherever possible. · In 1999, treasure salvors in the South China Sea located a junk so large that it was nicknamed " the Chinese Titanic" with its yield of over 300,000 pieces of porcelain - spurring a call for investors with the promise of large profits.